Of course there are some natural causes for hair fall but hair products like shampoo ,conditioner having so much chemicals are the main culprit for hair fall .According to a scientific evidence we shed an average of 150 hairs per day and high shedding is more than 150 hairs per day.Normally new hair grow to replace the lost one. But what is the main reason for hair falling ? Although many scientists and doctors still blaming on genetics or hereditary cause but the hair loss or thinning hair can be due to so many reasons and conditions. 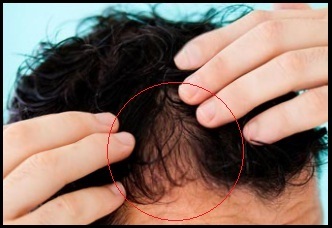 It is a hair disease which affects the follicles of hair.This is the portion of skin(scalp) from which hairs grow.Anyone can have this disease.But the main cause is unknown about Alopecia areata.But current evidence suggests that it is due to abnormality of immune system. -Proper blood circulation in the follicle or scalp is the important factors in keeping hair follicle healthy and productive.So an adequate intake of Vitamin E is necessary for proper blood circulation in the scalp. -Oil massage on scalp facilitates circulation.So do it on regular basis. But choosing an good oil is very important for hair massage.Any natural but pure oil like coconut,olive or even mustard oil is good enough.Try to avoid scented oil from market. Are Cardio Exercises Best for Burning Fat?